Curbside Consults: Listen to an interview with Dr. Patricia Kritek in which we take a deep dive into ARDS, beyond low tidal-volume ventilation, the importance of PEEP, neuromuscular blockade and prone positioning to highlight key clinical trials and discuss in detail how these therapies may work. Dr. Kritek is Professor of Medicine in the Division of Pulmonary and Critical Care Medicine and the Associate Medical Director of Critical Care at the University of Washington Medical Center. ARDS is a disorder of oxygenation that is secondary to diffuse alveolar damage. The damage can be scattered and nonhomogenous throughout the lungs. The causes of the inciting injury are broad and include pneumonia, sepsis, and aspiration (most cases), as well as trauma (lung contusion and nonthoracic), pancreatitis, inhalation injury, transfusion-related acute lung injury (TRALI), drowning, hemorrhagic shock, major burn, cardiopulmonary bypass, and reperfusion edema after lung transplantation or embolectomy. The subsequent inflammatory response to the underlying injury leads to damage to epithelial barriers (exacerbated by mechanical stretch) and accumulation of protein-rich edema fluid in alveoli. Over time, epithelial integrity is reestablished and alveolar fluid is reabsorbed. Fibrosis can follow and increase the risk for mortality. Physiologically, the alveolar damage results in ventilation-perfusion mismatch (V/Q mismatch), as evidenced by observations of increased shunting (alveoli unable to exchange oxygen) and dead space (microvascular injury leading to lack of perfusion). Because reliable biomarkers for the underlying injury of ARDS do not exist, diagnosis is based on clinical criteria. 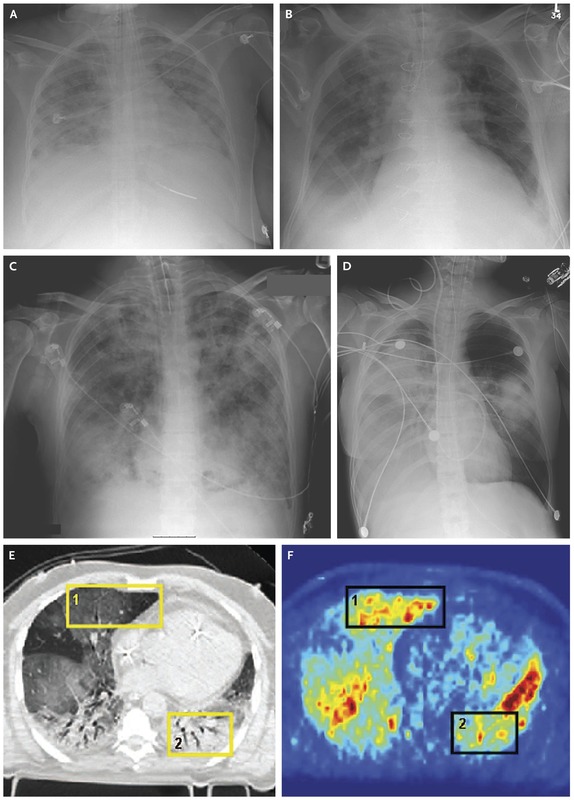 In 2012, the criteria for ARDS were revised in the Berlin Definition with the goal of identifying patients with evidence of alveolar edema on chest imaging caused by intrinsic lung injury rather than increased hydrostatic force (e.g., heart failure; see examples) and with hypoxemia (defined by the PaO2/FiO2 ratio) that requires some ventilation support (positive end-expiratory pressure [PEEP] ≥5). The severity categories also correlate with 90-day mortality. *Positive pressure can be delivered noninvasively in the mild ARDS group with continuous positive airway pressure (CPAP) FiO2 = fraction of inspired oxygen, PaO2 = partial pressure of arterial oxygen, PEEP = positive end-respiratory pressure. A limitation of the Berlin Definition is the use of blood gas measurement for partial pressure of arterial oxygen (PaO2). When blood gas measurement is not available, oxygen saturation by pulse oximetry can be used as a surrogate to avoid underdetection. Note: Mild ARDS was referred to as acute lung injury (ALI) in some literature before the publication of the Berlin Definition. After addressing the underlying cause of ARDS, the next step is supportive care that limits further lung injury. Over time, physicians began to realize that ventilators can cause harm through the various mechanisms described below. volutrauma (barotrauma): Delivering too much pressure leads to overdistention of alveoli. 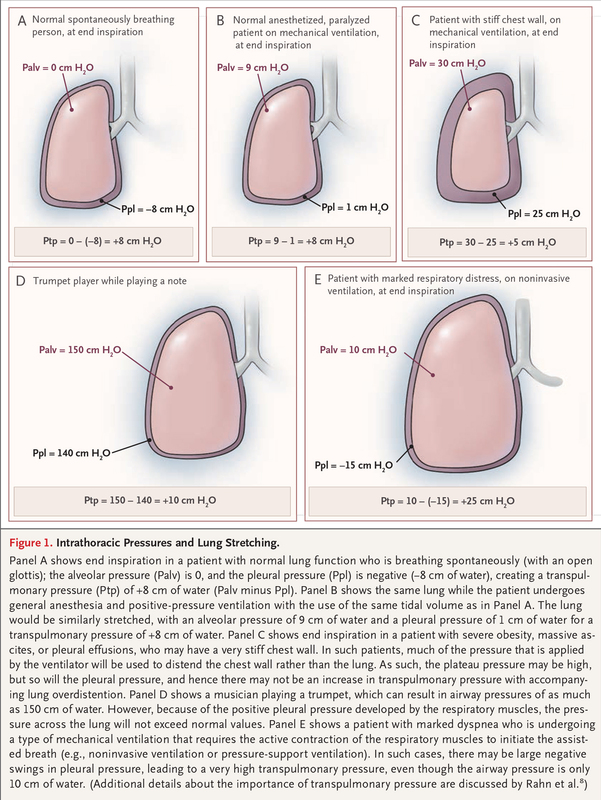 Because the compliance (Δ volume / Δ pressure) of the ARDS lung is heterogenous, the same airway pressure may cause underdistention of a more affected lung region with low compliance and overdistention of a less affected region. atelectrauma: Allowing alveoli to collapse completely during each breath cycle with too little airway pressure leads to shear stress and denaturation of surfactants. 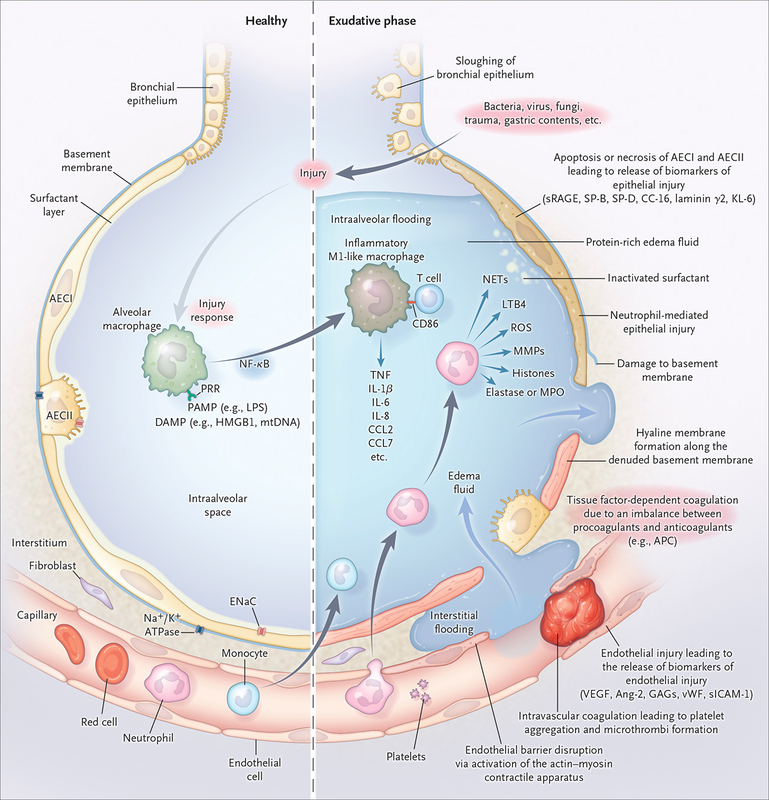 biotrauma: The physical force and trauma of ventilation (such as those described above) leads to release of mediators that sustain inflammation and translocation of proinflammatory products and bacteria through already permeable barriers, causing systemic damage. In 2000, the landmark ARMA trial (also referred to as the ARDSNet trial) showed that a ventilation strategy with tidal volume of 6 mL/kg of ideal body weight and a plateau pressure ≤30 cm water (H2O) resulted in 9% lower mortality than a strategy with 12 mL/kg of ideal body weight and a plateau pressure ≤50 cm H 2O (31.0% vs. 39.8%). Although the significance of tidal volume is often emphasized, it is important to remember that the ARMA trial also limited plateau pressure. ARDSNet ventilation is now standard of care. The ARDSNet pocket card is a useful reference for calculating the ideal tidal volume and provides some general guidelines for titrating ventilator parameters. For more on ventilator settings see the Ventilation section in this rotation guide. The increased dead space (ventilated but not perfused lung) in ARDS limits the fraction of each tidal breath that contributes to ventilation, leading to carbon dioxide (CO2) retention and subsequently acidemia. Although increasing the respiratory rate is helpful, a certain amount of hypercapnia (i.e., permissive hypercapnia) can prevent injury from increasing tidal volume. The pH goal is >7.30; a pH <7.15 may require additional treatment (e.g., bicarbonate). Normoxemia is not necessary, and trying to achieve it may cause more harm, often through the high PEEP required. The oxygenation goal is P aO2 of 55–80 mmHg or peripheral capillary oxygen saturation (SpO2) of 88%–95%. To achieve adequate oxygenation, PEEP is helpful for opening diseased and collapsed alveoli for oxygen exchange (i.e., recruitment). Recruitment maneuvers (maneuvers to hold a high PEEP for a period of time) are sometimes used to improve oxygenation, but the evidence for benefit is not definitive. 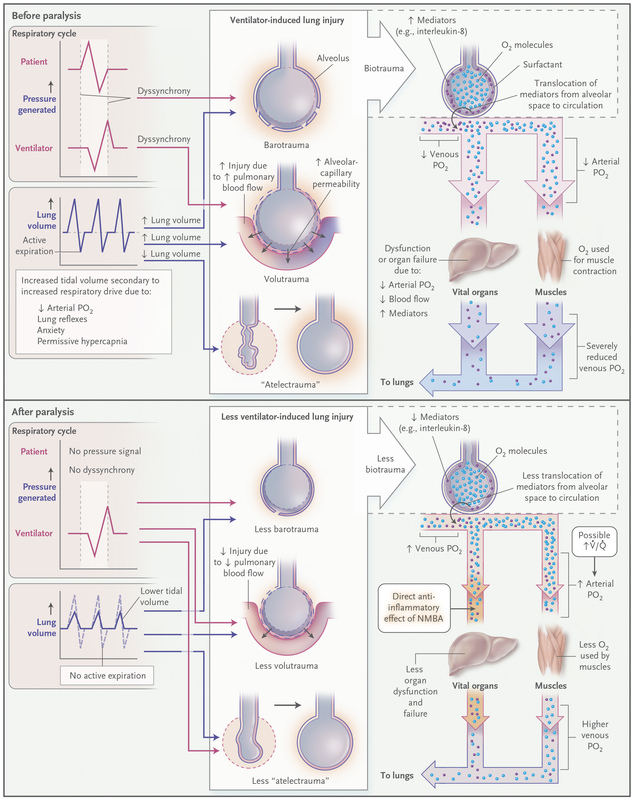 Too much PEEP can cause overdistention and pressure on pulmonary circulation, leading to increased pulmonary resistance, decreased left heart preload, and hypotension. One goal of adjusting the ventilator is to optimize the lung’s pressure-volume curve to stay between the ends of atelectrauma and volutrauma (see figure below; A and B on the graph correspond to the CT images used as examples). Sometimes such a high PEEP is needed that the plateau pressure exceeds the typical 30 cm H2O threshold for safety. In these situations, the high airway pressure may not be harmful because much of the pressure is needed to expand the tissue surrounding and compressing the lungs (as with severe obesity, massive ascites, pleural effusions, or a stiff chest wall). 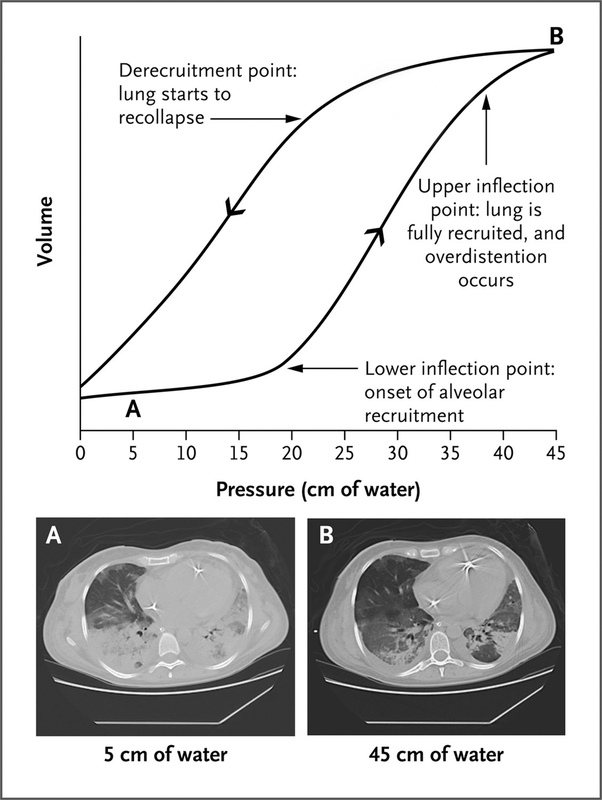 The transpulmonary pressure (Ptp) stresses and damages the alveoli; Ptp is the difference between alveolar pressure (P alv), measured by airway pressure on the ventilator, and pleural pressure (Ppl) (see figure below). An esophageal balloon can simulate the pressure in the pleural space and help titrate PEEP. One small, single-center trial showed that use of esophageal balloons was associated with improved oxygen and compliance and a promising nonsignificant reduction in mortality. The FACTT trial showed that a conservative fluid strategy decreased duration of mechanical ventilation, compared with a liberal strategy. Synchrony between the patient’s respiration and the ventilator improves oxygen by ensuring the right tidal volume (rather than the patient trying to exhale when the ventilator is delivering a breath) and prevents injury (e.g., panel E in the figure above depicting high transpulmonary pressure generated by the patient trying to inhale on top of the ventilator delivering a breath). Synchrony can be enhanced with the use of neuromuscular blocking agents (NMBA). The ACURASYS trial showed that the use of the NMBA cisatracurium within 48 hours of mechanical ventilation in patients with a P/F ratio <150 reduced 90-day mortality, compared with placebo (31.6% vs. 40.7%) and increased the number of ventilator-free days. Much of the benefit of cisatracurium in the ACURASYS trial is thought to be from minimizing ventilator-induced lung injury from dyssynchrony, once again illustrating the key principle of avoiding harm when treating ARDS. Other benefits include the possible anti-inflammatory effects of NMBA and decreased oxygen requirement by muscle paralysis (see figure below). One negative aspect of NMBA use is heavy sedation, which is associated with definite adverse effects. Patients typically lay supine in the intensive care unit (ICU); this position is associated with negative gravitational effects on the posterior lung regions, causing the heart to compress the left lung and more dependent atelectasis from interstitial edema. Placing patients in the prone position allows more lung regions to be functional and improves V/Q mismatch. The PROSEVA trial showed that, compared with supine positioning, prone positioning within 36 hours of mechanical ventilation in patients with a P/F ratio <150 reduced 28-day (16.0% vs. 32.8%) and 90-day mortality. Prone positioning requires an experienced nursing team to move the patient safely and prevent subsequent complications (e.g., pressure ulcers, extubation, intravenous decannulation), thus limiting its widespread adoption. View a video of prone positioning of a patient with ARDS. After exhausting the established therapies described above, the following additional treatments may be attempted for refractory hypoxemia, although strong evidence of benefit is lacking. airway pressure release ventilation (APRV): APRV is a mode of ventilation that inverts the pressure settings; a continuous high positive airway pressure is applied and intermittently released, allowing ventilation with the goal of sustaining lung recruitment. extracorporeal membrane oxygenation (ECMO): ECMO is reserved for the sickest patients (resources differ on the exact indications, but generally P/F ratio <60–80). Read more on ECMO in this NEJM review and on the Extracorporeal Life Support Organization website. inhaled nitric oxide: Inhaled nitric oxide can decrease pulmonary vascular resistance locally in ventilated areas of the lung and shunt more blood to that area, thus improving V/Q mismatch and oxygenation. Small trials (e.g., Rossaint R et al.) have shown benefit, but the effect may be transient. Real-time, ultrasound-guided cannulation of the subclavian vein has advantages over the landmark-guided technique. This video demonstrates the equipment and techniques used in the performance of real-time, ultrasound-guided cannulation of the subclavian vein. The indications for pleural drainage are diagnostic and therapeutic. This video demonstrates ultrasound-guided placement of a small-bore, pigtail catheter for drainage of a pleural effusion. Geurin C et al. for the PROSEVA Study Group. N Engl J Med 2013. In the multicenter PROSEVA trial, 466 patients with moderate-to-severe ARDS (P/F ratio <150) were randomized within 36 hours of intubation and mechanical ventilation to the prone or supine position. Prone positioning reduced 28-day (16% vs. 33%, P<0.001) and 90-day mortality (24% vs. 41%, P<0.001). All centers had used prone positioning in daily practice for more than 5 years and complication rates were similar in the two groups. This video demonstrates the assessment of neuromuscular function after administration of neuromuscular blocking agents. Because these agents can be lethal, clinicians should be familiar with the use of nerve stimulators and monitors in the assessment of neuromuscular function. The placement of a central venous line is an essential technique in the treatment of many hospitalized patients. This video will demonstrate the placement of a central venous catheter in the internal jugular vein with the use of one of several variations of the Seldinger technique.